KNOWN ISSUE -- Unable to clear Notification Bubble RESOLVED! I have a Samsung galaxy s7. The software just updated to Nougat. 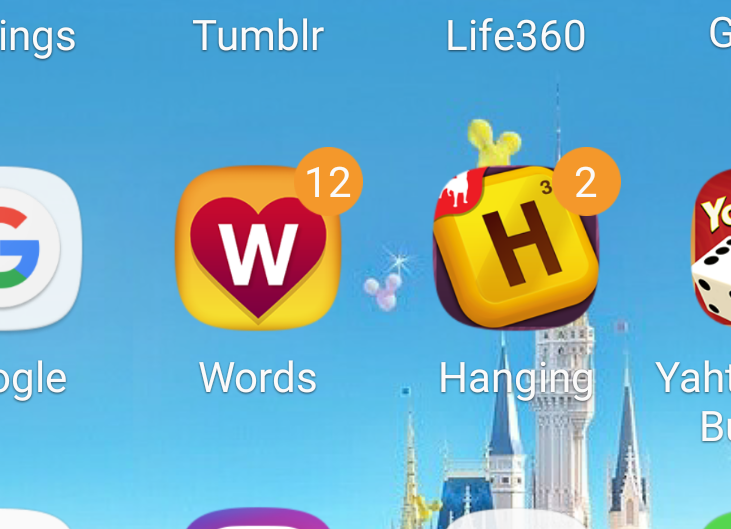 My Words with Friends is working fine, however the notification count is stuck on 12, no matter how many games and turns I have. I have attached a picture. I tried uninstalling and reinstalling, turning the phone on and off etc. Does Zynga need to update? Appreciate the report, @FarmerFranny. Have you tried clearing all the games under the Your Moves section? You may also try downloading the latest app version (ver 5.061) from Google Play. Let me know how it went. Thanks! Hi @Sofia Allianah I have tried all that. No matter what, it stays on 12. This started happening after android updated to Nougat. Thanks for bringing this up, @FarmerFranny. I'll go ahead and forward your concern to the team. The team is still in the process of investigating this error and they're currently working on its fix. Thanks for your patience, @MisterWyatt. Yep, same here. Nougat update, mine stuck on 9. Thanks for looking into a fix. Yes, the team is working for its fix, @Freeone77. We appreciate your patience. Just came back on to check on this issue. My android app updated but the notification bubble is still not working. This has been going on almost 2 months and as you can see, it's happening to everyone on android. I rely on this too. Why can't they fix it???? I just had an Android update and the game count was stuck, same as you all are reporting. I pressed and held the WWF icon to see what would happen and a little menu popped up, including something to the effect of "clear game count" which I selected. Now there's no game count at all, even when I have games waiting to be played! I like knowing before I launch the app how many games I have, in case I have a gazillion games and just a minute or two to play. Another issue I am having. If anyone has a solution. The icon on my app always displays that there are seven games. It seems to be frozen on that. Anyway to fix it. We have yet to receive updates on the Notification Bubble error, @kzeb, @julie3fan, and @Angela. Mine has been stuck at 2 since the Nougat update was installed on my Verizon S7 Edge. Mines still stuck and it's been 2 months. Same error (stuck on 3) since Nougat update installed yesterday on Sprint Galaxy S6. This error is still being investigated by the team, Wordies. We'll keep you posted. Your patience and understanding is very much appreciated. Notifiction Bubble stuck on 8. I Uninstalled the app and reinstalled it. Did not help. It has been several days. What do I need to do correct the problem? The team is still working hard to fix this error, Wordies. Please stay tuned for updates. I have the same issue as mine has been stuck at 7. Has anyone, including Zynga, contacted Samsung? I have had lots of problems with this update but they are no help on the other issues. A fix will be out soon, @ppalmeraz. Please stay tuned for updates. Looks like the fix for this isn't happening any time soon? What is going on? Are they really working on this for 2 months??? @Sofia Allianah @my sweet innamorata ???? Apologies, @JasmineBelle. We'll update this Forum thread as soon as hear from the team. In the meantime, I'd suggest to open your game from time to time and check for your moves. My S7 doesn't show any bubble notifications. I've uninstalled and reinstalled. Still nothing. @fletchardson, you rock! Deleting past games worked for me on my Note 5! Actually after I deleted the visible games, another game showed up which said I had timed out. After I deleted *that* game, the notification bubble was cleared. Finally!